I’ve been looking for a shutter for my dining room table for quite awhile. On a trip last month to a great antique house I found the perfect one! It has great form and just the right colors for my dining room. You see, I really would love to have a big farmhouse table in my dining room and it is not to be. 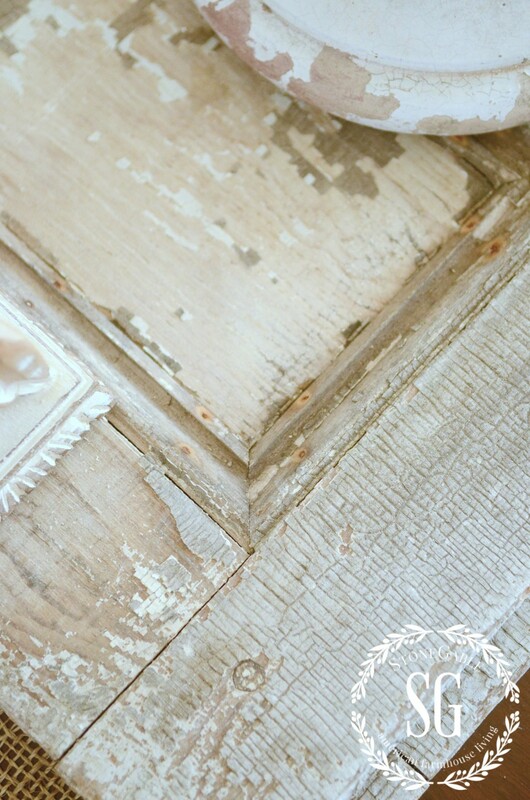 So I’m using the shutter as a “runner” and bringing a little bit of texture and chippy paint to my mahogany table. The look is simple, stripped down and fresh. Just right for winter. And the candles are battery operated and on timers. They look gorgeous in the evening!!!! Perfect for bringing a cozy glow to a cold winter night! Even if you don’t have a shutter for your table a runner lined with candles is a beautiful way to decorate this winter! Remember to pin this to your Pinterest WINTER or DECOR board. 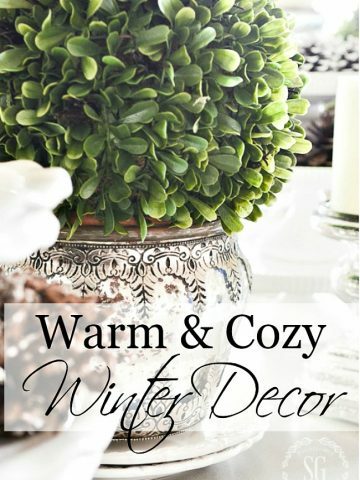 Follow me on Pinterest HERE and see all the cozy winter decor I’m pinning too! Do you follow me on Facebook? I share lots of great posts from around the web, my posts and seasonal archived posts, beautiful images from Pinterest and ask readers their opinions! Follow me HERE. Wow I just found your blog. 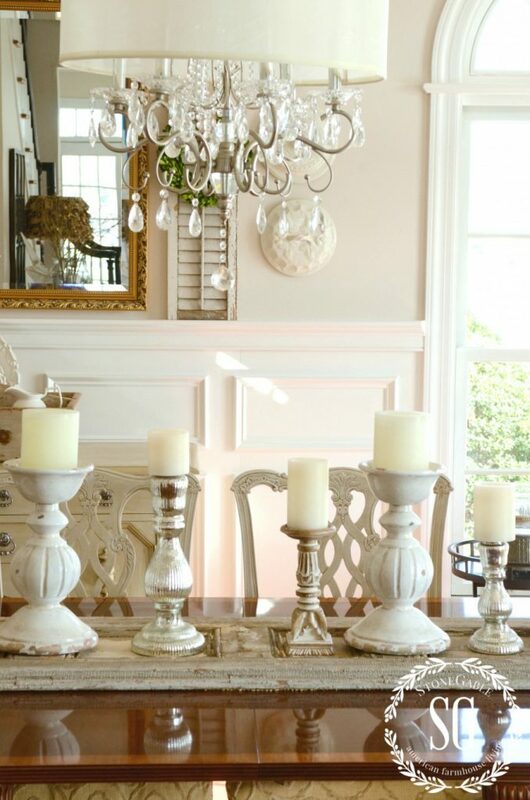 I’ve also been slowly adding diffrent white, silver, and mercury glass candle holders coastal chic themed dining room and dent but I haven’t been able to figure out how to display it. I never thought of the shutter. Thank you for sharing and keep it coming please. Welcome to the StoneGable family, Ximena! Yvonne, Looks spectacular! Don’t you just love the faux wax candles? I have them everywhere now–so convenient with the timers, and no mess or fires to worry about, especially with the little ones who visit. I have a weakness for pretty candleholders, and yours are beautiful! Enjoying our sunshine today. AMAZING! Thanks for sharing your talent with us! Once again thank you for your idea. Absolutely love the shutter. 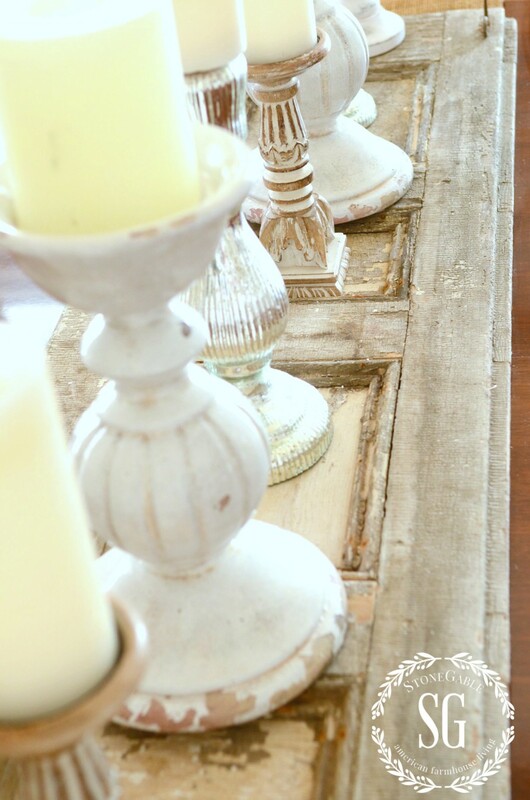 I love your shutter tabletop arrangement….. it would also be pretty with mirror insets in the shutter. I think it looks great, Yvonne. Like the old quote, “Do what you have with what you have, where you are.” Perfect! I do love everything about this look! So fresh! I must go find a shutter now! Happy New Year, Yvonne! I knew that shutter was perfect for your table and dining room the very moment you laid eyes on it….That shutter was waiting for you to give it a good home…loved how you lined up the candlesticks on it!…So very beautiful!! What a cleaver idea! I would have never thought of such. Always fun to stop by! Love the shutter Yvonne, I’ve been looking for one at garage sales and flea markets for a couple of years now, but haven’t found one that I love yet. Another inspiring post. That shutter is the perfect colour and the patina is wonderful. I have a thing about lighted candles in my home. You hear so many fires that are started by candles. Battery operated and on timers is the perfect solution. I just discovered your blog today and have had so much fun checking it out – I love your decorating style! I received some of those great candles for Christmas and have been enjoying that they come on and turn off by themselves every evening. Now that I know where to find them I’m going to see if I can pick up some more. Your tablescapes are gorgeous! Welcome to the StoneGable family!!! This is beautiful pretty lady. 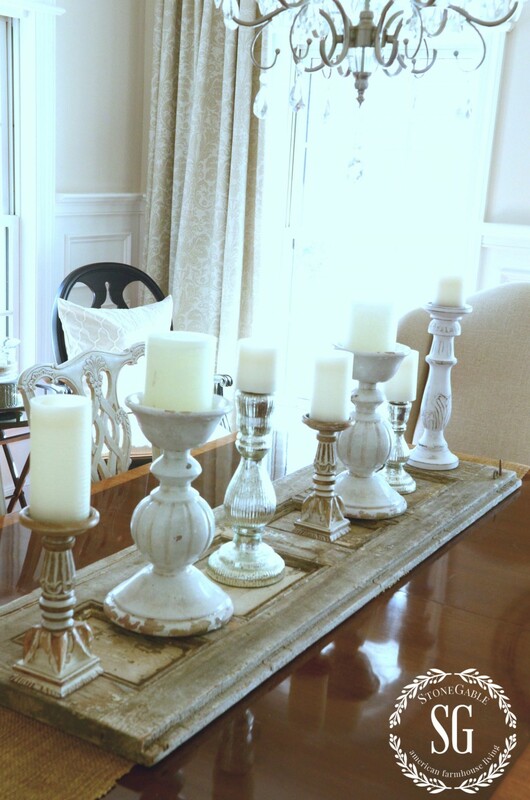 I love the silver candle holders on top of the distressed table as much as your gorgeous centerpiece. Have the best new year ever! 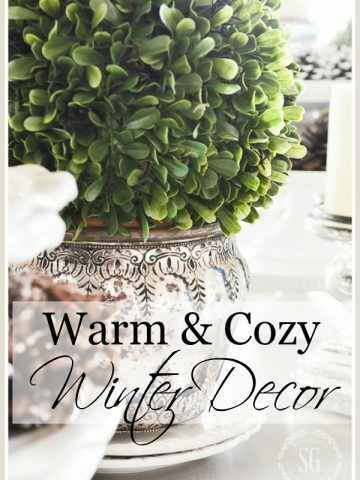 Love your center piece for your table and candles in the winter make it warm and cozy. May I ask, who takes the photos for your blog? I just LOVE the photography! Hi Kim, I take all of my own photos and write all my posts. Thanks!!! Wow, so nice to hear! I call the candles white-ish. this is a perfect look for this time of year. that shutter is amazing!! 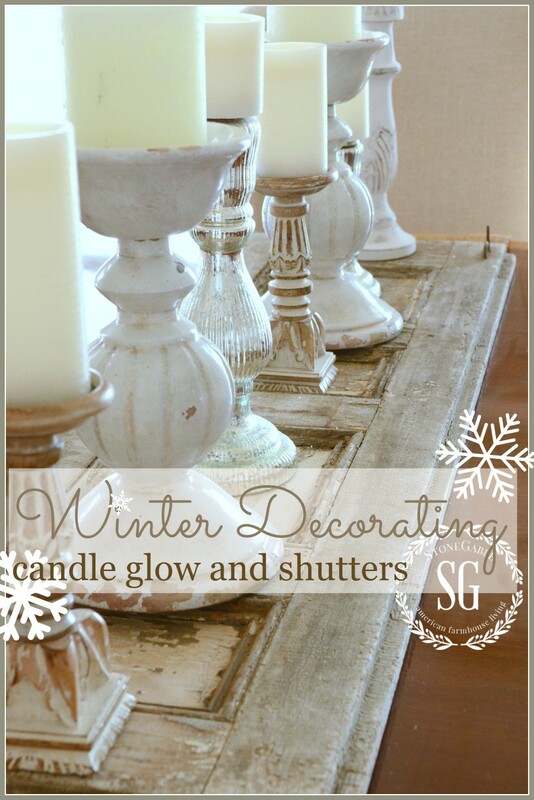 Love the shutter and the candles on your dining room table – what a great idea for winter! I’m a “newcomer” to your blog – just discovered it this fall – and love all of your posts, especially the decorating and tablescape/dish ideas! My husband and I have the dream to one day own a farmhouse and your ideas are fun to add to that dream. Thanks for sharing – looking forward to seeing your posts and projects in 2015! Hi friend, Lanita! I too have just found her blog and joined today. Loving the ideas and the Sunday blog! Welcome to the StoneGable family Judy!!!! So happy your found StoneGable and me! Welcome to the StoneGable family, Lanita! Do you get my newsletter. Look on the right side of my blog under my picture to sign up! Your ideas are very fresh and inspiring….and the photos are stunning. You have a real talent. Thanks for sharing your gifts with us. I would like to make a request, to maybe see a longer shot with a view of the whole table in context with the room. After I took the pictures I thought of that too, but by then it was night time! Thanks for the suggestion! I love this look! I’ve been on the lookout for shutters for awhile…my fave vintage shop keeps selling out of them quickly. They are so so popular!~ When I see a great shutter at a cheap, not even reasonable, price I buy it! Oh, I am dazzled!! You have such delightful decorating ideas and your lovely home always intrigues and comforts me! The shutter idea is really fun and you have instilled in my an urgent need to jump onto Etsy and find one! My dinning room is very small; actually it is merely an extension of the living room, so I think a small shutter would suit the purpose. Thanks for all of the fun posts…you always make me linger and dream!!! Where did you find such lovely candle holders? Mary, I usually shop at stores like HomeGoods, TJ Maxx, and outlets. I pick them us wherever I see them. If they are a bargain and I love them… they come home with me. I never pay a lot for accent pieces. LOVE that shutter Yvonne!! Such a beautiful looking centerpiece…I bet it looks so pretty at night! Love, love, love the shutter! Such a fun idea!! What a lovely Winter look. 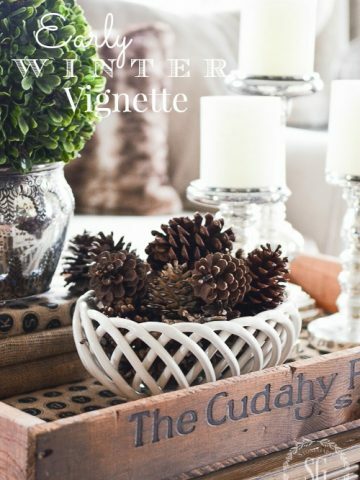 I have always felt that Winter White after all the Holiday decor is a fresh and light look. My question is do you use your Dining Room table and if so do you remove this each time. I rarely use mine since I am a empty nester and we have a kitchen dining area that gets most of our daily use. While my decor style is different the theme is similar. Thank you for your hard work and sharing your home. Corinne, we are in the same situation. I use my dining room table but not so much anymore. When I use it the shutter would come off. THanks for your sweet comments! What kind of candles are these and where do you get them? I’m pretty tired of how ugly real candles quickly get after burning them a few hours. I’d love to have some that never get that ugly look! Hobby Lobby carries candles like these with the timers and flicker light. They have good every day prices, as well as sales on some types every other week. Great to know! Thanks Ann! I got a couple six packs from Costco in December. They look very real! And 6 of them were only $19.00! SCORE! WOW!! I love those candles; you did get a steal. Goodwill had 2 similar ones and wanted $9 for one and $7 for the other. I was too cheap to buy them. The ones from Costco looked so real, that when my daughter was visiting home over Christmas, she attempted to light one! Gorgeous, Yvonne! Simply gorgeous! I would have never thought of using a shutter as a table runner, but love the idea! It is a great way to add “chippy” farmhouse style to any piece of furniture. 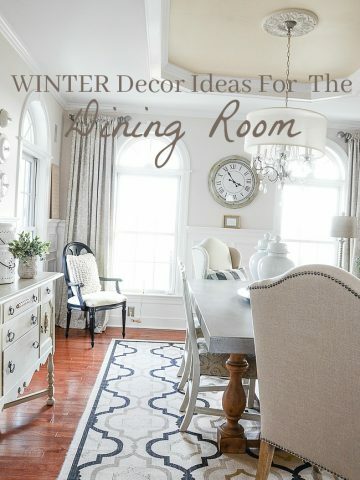 Thank you for sharing all your decorating finds! I look forward to each and every post. I may have asked this before….I love the look of the shutter on the formal table….what do you do to prevent it from scratching your mahogany table? Thanks! LINDA AND KAREN answered your question Lisa! Right now the shutter is on a runner, but when I get to my local hardware store I’m putting felt pads on the back of it. Great minds think alike, girls! You could also use those felt “sticker” things to keep anything from scratching your tables or furniture. I keep a variety of sizes of those because I’m always switching things around. They help keep things from scratching your walls as well, like wall hangings or pictures. It appears to be laying on a burlap runner.